To understand what marketing messages and channels of delivery are most valued by today’s customer, the Chief Marketing Officer (CMO) Council and InfoPrint Solutions Company undertook a survey of nearly 1,000 U.S. consumers. When given the opportunity to choose, 51% of consumers prefer to receive product or service promotions via traditional mail, while 44% prefer email. 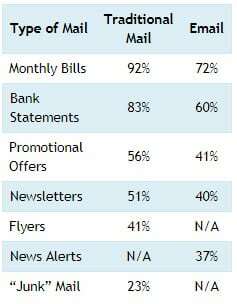 Nine out of 10 consumers open monthly bills delivered via traditional mail, compared to 72% who open bills delivered via email. For all types of mail received, print mail is opened and viewed by consumers more than email. Three-quarters (73%) of consumers say they would opt for more traditional mail vs. electronic statements if the government certified that mail had less environmental impact than electronic delivery. While 64% of consumers say promotional offers dominate both the traditional mail and the email they receive, only 41% view these as must-read communications. Of the 91% of consumers who opt out or unsubscribe to emails, 46% do so because the messages are not relevant. Four out of ten (41%) say they would consider ending a brand relationship due to irrelevant promotions—whether print or email. An additional 22% say they would definitely defect from an offending brand.